A Jewish man was violently assaulted in an unprovoked attack while crossing a street in Crown Heights on Monday afternoon. The incident occurred at around 3:50pm at the intersection of Empire Boulevard and Albany Avenue. The victim was accosted as he was crossing the street by a black teenager carrying a wooden stick. When the victim realized he was about to be assaulted he attempted to flee. The victim ran into the nearby dry cleaner, owned by R’ Shloime Junik, whose son tried opening the door to provide shelter to the victim, though not fast enough. 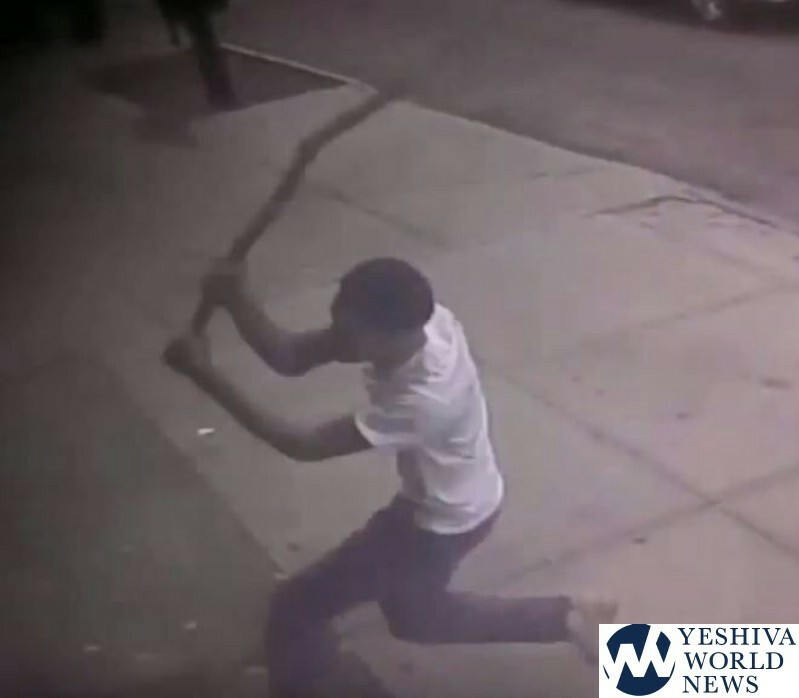 The attacker managed to swing and strike the victim over his back and shoulder causing the stick to break in half. The perpetrator then threw the second piece into the store, striking both the victim and another bystander and causing further injuries. After his arrest the suspect was charged with felony assault, menacing, harassment, criminal possession of a weapon as well as a hate crime. Why do you post a video with a pruste picture? A primary purpose of Yeshiva World is not to have to see such things. The video is unclear. Did the yid being attacked make any effort to confront this kid? He appears to be crossing the intersection and then running away. 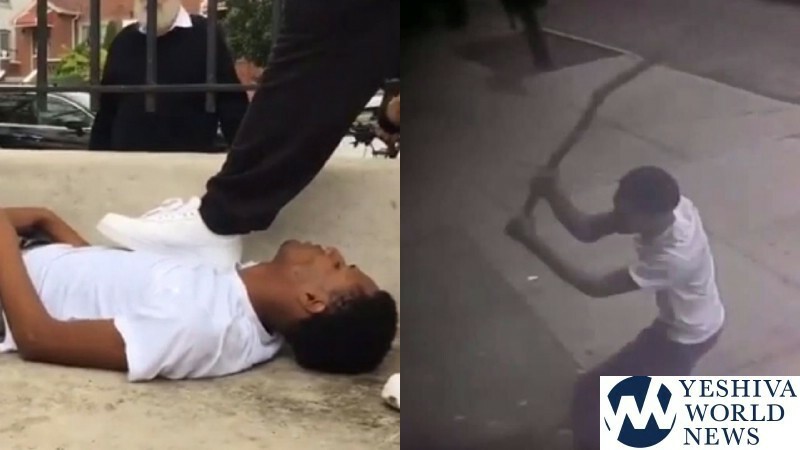 Fortunately, there were several individuals who realized what was happening and immediately sought to chase him down and detain him for the police. Also unclear why he was released unless the police don’t have the ability to arrest and detain someone for shoplifting which is probably a low level crime. Gadolhadorah, I lived 30 years in CH. The place is a cross between a jungle and a war zone. If a Jew is on the street, that’s provocation/confrontation enough for these mamzerim. And he was running because this animal was about to attack him with a tree branch! I don’t think you’d hang around either in his place. Please make laws and vote for the laws which makes the criminals to be deported from USA back to the zoo that they came from. America do NOT need these criminals here. Do NOT give these beasts, “green cards” to stay and bit innocent in the streets and citizens walking in our parks!!!!!!! Do not let their “green cards” turn into citizenship passports!!!! We do no need beasts as our fellow citizens! Most of these beasts tricks officials in the borders of Canada and USA and enter from the border of “Canada, USA” here, because the doors of Canada is open and welcoming to these beasts after a while, they stay, they become Canadian citizens easily and enter USA easily from borders as Canadian citizens!!!!! The beasts have wild barbaric manners to bit and kill innocents in USA, be aware police and officials in airports and borders of Canada and USA. Do not let them enter. USA, Look at their names and the place of their birth from which zoo they came from. Do NOT get fooled with their claim that they became Christians! They even hang cross necklaces when they are in airport and in borders to trick offices that they are Christians!!!!!! Stop them before it would be late, should we all hide in our homes from the fear of their attacks. May G-d rescue us all from enemies.